I felt a bit loathe to talk about this because it’s very personal to me. But at the same time I wanted to share how my experience of illness has shaped my writing. When I was 15 I suffered from a severe mental breakdown. I had been incredibly unhappy at school – it was my GCSE year (for those of you who don’t know the UK school system it’s the end of school exams we take at age 16) and I was struggling. I felt I had very few friends and those I thought I had turned out to be – well not great. Everything was too much and in the end I fell over the edge. I couldn’t have been more ill really. I was hospitalised and spent months recovering. Fortunately I didn’t have to go back to school. I was able to take my exams at the hospital school and I managed to gain 7 of the 9 qualifications I’d been intending to obtain. Life improved for me. I was happy. I went to sixth form college to do my A levels (a bit like high school, it’s for 16-18 year olds and at the end of the two years you do more exams, but generally in 3 or 4 subjects no more) and whilst I had to stick with just 2 A levels, again I managed it. Then unfortunately at 18 I got ill again. I won’t go in to the ins and outs, but basically it was medical error. I’d been planning to do an extra year at sixth form college but it never happened. I had to take the whole year off to recover. But. Just a year after that I was able to go to university – which happened to be down the road from the hospital I’d been treated in – and fulfil my dream of doing a degree in English. I graduated in 2003. A year later I was ill for a third time, again because of medical errors. But having spent months in hospital, this time I recovered and although I’m still being treated for my condition and always will be, I’ve been well for 8 years now. I’m on track to have a whole 10 years straight without an episode of illness for the first time since I was 15. Yay! And I’m going from strength to strength. I’m capable of a great deal more than I used to be now. So how have my experiences shaped my writing I hear you ask. The answer is enormously. Whilst I may not write about mental health or the lack of it directly in my stories, the experiences I have had have given me a sensitivity to mental illness or mental imbalance. My characters have struggles with their emotions and feelings as in all stories. But with me, I know first hand how far and deep that struggle can go. I try to make my characters’ struggles true to life, not sensational or unrealistic. They may not be having a severe breakdown, but I create for them tough situations that I myself would struggle to deal with. Having said I don’t write about mental health directly in my stories, that’s actually not quite true. About 10 years ago I started to write a semiautobiographical story called ‘Fractured Mind’. It’s about a girl who’s very lonely at school and when her one friend dies, this tips her over the edge and she becomes very ill. She thinks everyone’s out to get her and in the end she’s hospitalised. It’s very close to my own experience. I got about 100 pages written but no more. Maybe I’ll return to it some day. Overall I would say that my experiences of being ill and the consequent suffering I endured as a result – because each time I was severely ill – have made me who I am today. I’m not sure I’d say I’ve come out stronger as such, but I’m way happier now than I was at 15. Maybe everyone can say that, but I know I haven’t had the same life experience as many people. It’s definitely shaped my writing. I think my illness has given my writing an edge. So perhaps I’ll be bold and someday finish ‘Fractured Mind’. At the very least it may open people’s minds a little to what mental illness is really like. And that can only be a good thing. 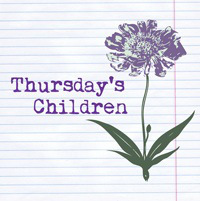 If you would like to take part in Thursday’s Children, simply write on your blog about what inspires your writing. Then add your name to this linky. Big thank you to Rhiann Wynn-Nolet and Kristina Perez for hosting. Thank you for being so brave and sharing your story. I’m so glad you’ve been healthy for quite some time now. Mental health, like physical health, is probably taken for granted by most of us, but life events can sometimes pull apart even the most “together” of people, to the extent that they barely recognize themselves. Thanks Rhiann. It’s so true that we take good mental health for granted until something happens and we don’t have it any more. It was hard for my family when I was ill, especially for my parents. They didn’t really have any experience of it before, so it was a bit of a shock for them. Now though they know an awful lot. I think knowledge and understanding of mental illness is key to breakthroughs in the treatment of it. Elaine, I’m so glad you shared some of your struggles. My mom wrote a newspaper column before she died. In one story she was near death from a miscarriage hemorrhage, and I love how she put it. “Usually I don’t mind when something dramatic happens because I know I can write about it one day.” 🙂 I’m sorry you went through what you did though. Sounds like a horrible few years. So glad you have been healthy lately. We graduate college the same year, btw. 🙂 hugs and well wishes! This is a wonderfully brave post, Elaine. And honestly, I do hope you finish A Fractured Mind. It sounds like a book that needs to be out there in the world. FRACTURED MIND sounds like a great story. And you are the one to tell it. We need more sensitivity in these areas of like and for a young girl, yes, your illness would have shaped who you are, but as I believe–all hardships make us stronger, allow us to never give up–if that’s what’s needed. And nothing goes to waste. I had a lot of trouble in school with family problems and a near nervous break down in collage. Ii would love to read FM–or anything else you write! hugs! Hi Karen. Thanks for that. I really do think from all the positive responses I’ve been getting to this post that I ought to ressurect that story and continue it. I think you’re right about hardships making us stronger. I feel like although other people are stronger than me in some ways – maybe in the way they react to stress – I am stronger in other ways. I think the old saying is so true ‘it takes all types to make a world’ and that we need people in the world who’ve had different life experiences. sorry–not sure what typo ‘like’ was supposed to be? fingers were flying.